An absolute must for any decking system is for it to be strong, robust and safe – and Liniar’s galvanised steel sub-frame creates the ideal maintenance-free base on which to build a deck. Many decks are built on a timber sub-frame, as this has always been the traditional material of choice – however there are a number of reasons Liniar has developed its own galvanised steel sub-frame and why we recommend our decks are built using steel, rather than timber. Unlike timber, galvanised steel doesn’t rot, ensuring that Liniar decks are built to last beyond the 10 year guarantee. Even treated timber, sitting in wet conditions, will soak up moisture from the ground beneath it, as well as from the deck itself. Because they’re hidden underneath uPVC deckboards, timber sub-frames are unable to dry out naturally and will instead ‘sweat’ – a process that will increase the rate at which the timber rots. As galvanised steel doesn’t absorb moisture and is treated so it won’t rust, you can rest assured your deck will be safe and secure for many years to come. A further safety consideration is fire. Unlike timber, galvanised steel sub-frames comply with fire safety regulations, as any fire simply won’t be able to take hold and spread – keeping your family and belongings safe. Liniar’s sub-frame consists of just two components – a galvanised steel ‘I’ beam and its connector. 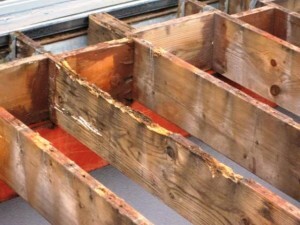 The sub-frame is connected into a grid pattern and the deckboards are fitted directly to the joists. 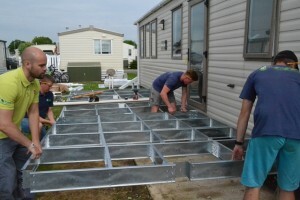 This means that any deck built on our steel sub-frame may be extended, moved or repositioned with minimal risk of damage or disruption – unlike timber foundations, which are much more difficult to move. And we’ve now made our sub-frames even easier to assemble. The steel is pre-slotted so no pre-drilling is required, and our recently launched uPVC sub-frame Nogging is a quick and cost effective way to connect all sub-frame joists with the minimum of preparation work. The Nogging is pre-cut to suit the maximum 600mm centre between joists and has two screw ports to accept PVC screws through the slotted steel. On an average wrap-round deck, these improvements could mean an installation time saving of more than two hours! See the difference for yourself on our comparison video. The new Nogging is also now standard on all decking kits. 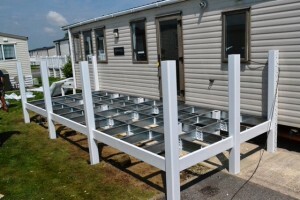 When fitted onto the galvanised steel sub-frame, a Liniar deck can withstand a load in excess of 500kg/m², as verified by independent testing. In addition, Liniar’s ramps are built using the same strong and sturdy sub-frame and deckboards, so they will easily take the weight of a mobility scooter. Liniar lead-free uPVC decking is now available in kit format, including pre-assembled galvanised steel sub-frame sections for even easier assembly! Click to find out more about Liniar decking kits.